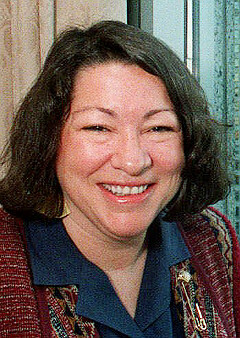 Judge Sonia Sotomayor (U.S. Court of Appeals, 2nd Circuit) nominee for the United States Supreme Court. President Barack Obama showed sound judgment and profound respect for our nation’s highest court by selecting an individual who has impeccable credentials and is committed to our constitutional values, rights, and liberties. Judge Sonia Sotomayor brings not only a distinguished legal background to the Supreme Court, but a wealth of common sense understanding of how the law affects everyday life. Sotomayor has been called "a uniquely well-qualified Supreme Court nominee, someone with a sharp and independent mind, and a record of excellence and integrity" by the Leadership Conference on Civil Rights. When Sotomayor’s nomination was made official in the East Room of the White House last month, numerous Jewish organizations were in attendance, including the National Jewish Democratic Council (NJDC). We were proud to be there and be a part of this historic moment. Many leading Jewish groups, in addition to NJDC, have praised the Sotomayor nomination and her strong credentials, including the American Jewish Committee (AJC), Anti-Defamation League (ADL), Jewish Council for Public Affairs (JCPA), Orthodox Union (OU), and Religious Action Center (RAC). Richard Foltin, Legislative Director of AJC, said to JTA, "there’s no question of her impressive qualifications." The ADL released a statement declaring that Sotomayor "will undoubtedly bring an important new perspective to the work of the Court." Within our community, a consensus has developed: Sotomayor will be a welcome addition to the Supreme Court. If confirmed, Sotomayor would bring more federal judicial experience to the Supreme Court than any justice in 100 years, and more overall judicial experience than anyone confirmed to the Court in the past 70 years. She has been a prosecutor, a corporate litigator, and a now a federal judge for the last 17 years. Sotomayor’s quintessential American story and strong legal career provide her with unique qualifications to be the next Supreme Court justice. Former Chief Judge of the Second Circuit Court of Appeals Jon Newman said Sotomayor “is everything one would want in a first-rate judge.” Her ascent to the federal bench from an upbringing in a South Bronx housing project is an inspiration, in and of itself. Support for Sotomayor’s judicial career has transcended political lines. Before she was nominated to the U.S. Court of Appeals for the Second Circuit by President Bill Clinton in 1997, and confirmed by the Senate in 1998, she was nominated to the U.S. District Court for the Southern District of New York by President George H.W. Bush in 1991 and confirmed unanimously by the Senate. It has been disappointing that leading Republicans have taken the nomination of Sotomayor as an opportunity to launch nasty attacks on her character and question if she really has what it takes to serve on our highest court. They ignore the fact that she was first appointed to the federal courts by a Republican president. It is one thing to stand against a nominee on ideological grounds, and another still to do so on partisan grounds. But when Republicans depict Sotomayor as a racist they go beyond the pale. Although there are some in the GOP who sanely call on their colleagues to “refrain from calling Sonia Sotomayor a racist,” Republican Senate Leader Mitch McConnell (R-KY) has “refused…to condemn [these] controversial comments.” And then there are the absurd Republican attacks that Sotomayor is somehow an “intellectual lightweight.” Her academic qualifications are impeccable and she is at least as intellectually qualified or even more so than any justice sitting on the bench today. Sotomayor’s 20 years of service in the federal courts exceeds comparable experience of anyone recently nominated. This kind of rhetoric and these spineless attacks are inexcusable. The President believes it is important for the Senate to vote and confirm Sotomayor before the August recess, to allow the new justice time to prepare and participate when the Court confers this fall and selects cases to be heard for the upcoming term. I agree. The ridiculous Sotomayor bashing must stop. Republicans and Democrats should work together to review Sotomayor’s record and work towards a confirmation this summer. Ira Forman is the Executive Director of the National Jewish Democratic Council (NJDC).